45:9-7.1 Continuing medical education required as condition for biennial registration. a. Except as provided in paragraph (2) of subsection d. of this section, the State Board of Medical Examiners shall require each person licensed as a physician, as a condition for biennial registration pursuant to section 1 of P.L.1971, c.236 (C.45:9-6.1), or as a podiatrist, as a condition for biennial registration pursuant to R.S.45:5-9, to complete a requisite number of credits of continuing medical education, all of which shall be in Category I or Category II as defined in subsection i. of this section. Each licensee must complete a minimum of 30 hours of CE credits during the two-year period preceding renewal. Dentists: NJ accepts BLS and ACLS as continuing education credits. 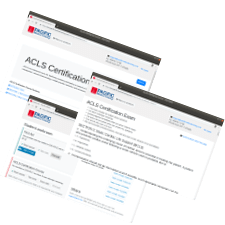 Additionally, our ACLS and BLS courses are ADA accredited. Select: Chapter 30 New Jersey Board of Dentistry Regulations 40 hours of continuing dental education iii) A maximum of five hours of continuing education credit shall be given to a student or an instructor for basic Cardiopulmonary Resuscitation courses and a maximum of 15 hours of continuing education credit shall be given to a student or an instructor for Advanced Cardiac Life Support courses. Total number of locations: 30. These locations CAN provide American Heart Association-branded provider cards if needed. A lifeguard had the chance to save a life when he pulled a 24 year old man from a pool. After a man had spotted the drowned individual he called for help and the Lifeguard quickly rushed to check for vital signs and administer CPR techniques until the EMTs and Princeton officer arrived and transported the almost dying man to a medical center. A 68-year-old man collapsed due to a seizure at jury duty pool. That is when Edison Police Sergeant Michael Carter jumped into action to administer CPR to the almost dying man. “My training just kicked into gear, Thankfully, I was in the right place at the right time for this gentleman,” said the heroic officer. He continued CPR while waiting for the rest of the officers to arrive with a portable defibrillator, a shock was given and EMTs arrived to stablize the man and transport him to the hospital.